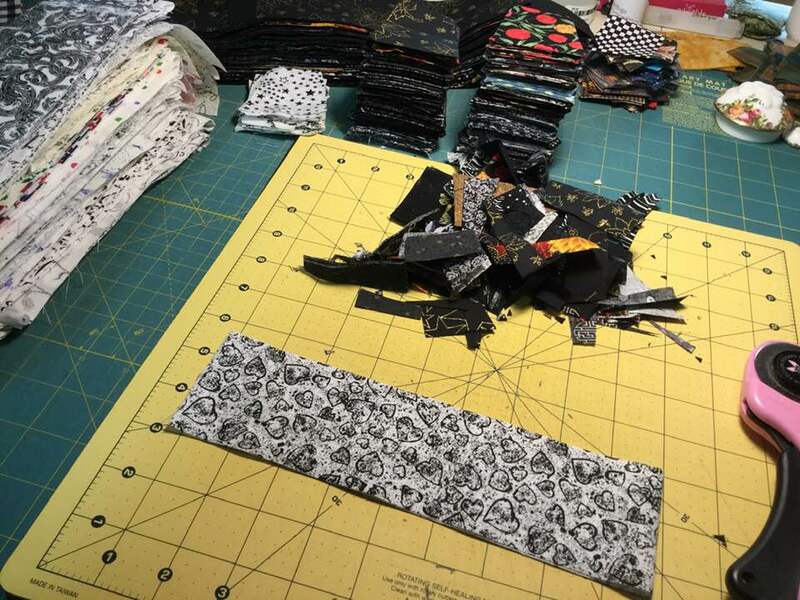 Bonnie Hunter's 2018-19 Mystery Quilt "Good Fortune"
Thread: Bonnie Hunter's 2018-19 Mystery Quilt "Good Fortune"
I'm probably wrong about the strings -- just speculating! If she does strings and you have known issues just get a stripe fabric in the color she is doing strings in. I hope there are no strings. The blue strings was when Orca Bay became a UFO for me. I think if she does strings again, I will just cut the piece from one fabric. I know it takes away some, but it should save my sanity. I hope there are no strings too. It's great for people who keep strings in their stash but I always make a tremendous mess cutting them. After going thru my stash, not near enough orange but I do have the red and blue in toscana. So it's off to the LQS today, I think I will try to use toscana in all the colors out of yardage. Got my color chips at Lowe's. Colors are primary colors and I like them so I will keep to Bonnie's colors. I looked through my stash and lo and behold...I can make this quilt from my stash only. Not that this will happen ever happen (LOL). I still think I will probably just print out all the clues and then decide if I want to do the mystery. Although, if I only do a 1/2 size (36" x 36") that shouldn't be too overwhelming. Can't wait to see the first clue and how everyone's blocks work up. Actually, half size would be 36" x 72"... or some wider, less long configuration. If you want 36"x36", you only need to make 1/4 of the units. My back for Good Fortune is finished except for sizing it up for the machine quilter. 72" square isn't for me, I'm figuring 18 more of whatever units we make plus some interesting inner borders. haven't looking in the fabric closet yet, I'm enjoying the anticipation! You wouldn't know it to look at it, but this back is the culmination of trying to do something with Bonnie's rail fence leader ender challenge this year. Now I'm trying to think what to use for leader enders next. Wow, Kalama! That is quite a backing! How about doing Jewel Box Stars as your next L/E-? It's the remark Bonnie made when mentioning using 1 fabric per color that got me wondering. I'm not allowed to quote the remark here, but it's in the introduction just before the pictures of the paint chips. Normally she says it's fine to use just 1 color and leaves it at that, but this time she followed up with some rather mysterious comments. As I recall, there was also an issue with 1 fabric per color in En Provence, because of the neutral 4-patches. I can't remember when Bonnie suggested people bring in another neutral in that mystery -- if it was in the intro or when clue #1 came out. I know she likes to avoid giving anything away for as long as possible. Oh good call Lisa! I did go back and read her comments. Right after saying if using 1 fabric you're fine she does make a rather odd, cryptic comment. I had forgotten about the En Provence 4-patches... those doing scrappy were encouraged to use a two-tone approach to the neutral 4-patches while those using just 1 fabric basically got to skip a step. Well bother! I had planned to just use 1 fabric per but I needed 2 orange fabrics for my neutral to have enough yardage. I guess if it **is** strings I could just alternate - or just use one or the other.... hmmmmm..... maybe I'll wait until the 2nd clue is revealed and decide. Funny that strings have come up - I was looking over a lot of Bonnie's other patterns and saw some using strings that I really like! 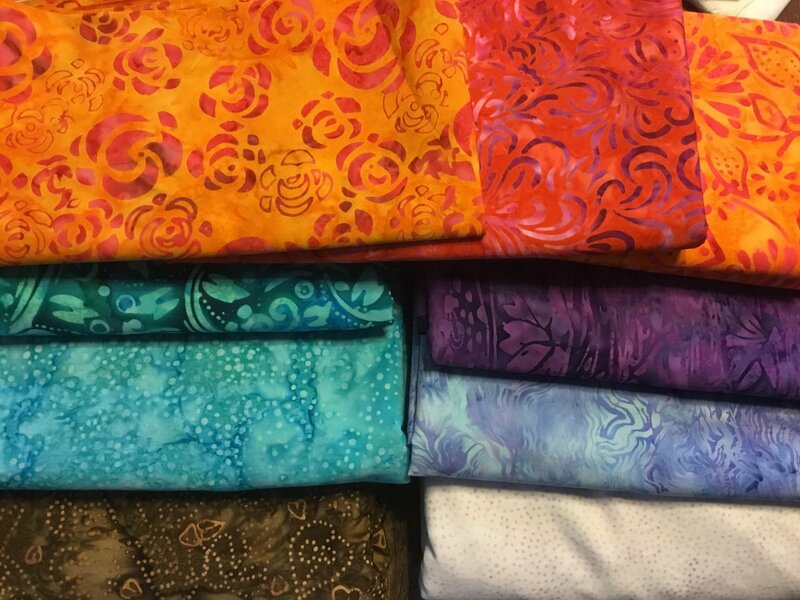 I have not decided on fabric yet, maybe this weekend I'll have time to spend with my stash until something "speaks" to me. [QUOTE=Macybaby;8157903]Funny that strings have come up - I was looking over a lot of Bonnie's other patterns and saw some using strings that I really like! I'm also "watching" to see if strings are included. They can be a bit of a challenge for me, but I'm up to it. My Quilted Twins Good Fortune package came in the mail today. I am thrilled with the neutrals and the only one I question is one of the blues where there is high contrast in the fabric. Top blue. Terrific fabrics Battle Axe! IMHO the top blue has too much white in it. Perhaps set it aside as an extra if needed-? Nice variety of neutrals, and oranges too. Those are beautiful neutrals, Battle Axe! I agree, that blue could be a problem. I guess just wait and see what kind of units use the blue. I wonder what colors will be next to each other. I love the orange and red together. What do you think our first clue will be? I'm guessing 700 1-1/2" finished HSTs, LOL. Btw, I didn't take to the Simple Folded Corners Ruler when I first tried it in last year's mystery, but I've used it all year and am getting good results with it now. I'd love to have strings--they are my favorite! Wowser!! That many HST at 1.5 finished. I sure hope not. I'll try to replace that top blue, the contrast is too much and would show up, I'm afraid. I love to order fabrics that others have picked out. If I go to the same store, I would never find some of those interesting neutrals. Great fabrics! The neutrals are fabulous. I agree that that one top blue has too much white. I wouldn't use it. But the rest look great. Those fabrics are great! I wouldn't eliminate any fabrics until she puts out some clues. Remember Allietare? Some of the blocks were large (by Bonnie standards) so your blue could work. Even if it ends up being cut smaller - maybe it will be part of a 3.5" HST with the orange - then I think it would be fine. I've made dozens of scrap quilts and just when I think a fabric is too light, too blue, not green enough, by the time I get towards the end of the project and need more of a certain color - and don't want to cut into yardage, my standards are lowered (or vision broadened?) and I end up deciding to include pieces I had originally crossed of the list. Up close a fabric might not work, but as part of a quilt, it's just one or two small pieces and it's fine. black and white...in scrappy definition. Now I will pick my fabrics! To fun to be legal. I just thought of something else that might indicate strings -- Bonnie's new book (not sure when it comes out) is called 'String Frenzy.' Her previous string book, 'String Fling,' featured two quilts that were mysteries -- 'Roll, Roll Cotton Boll,' and 'Orca Bay.' Maybe Good Fortune is featured in the new book. Does anyone know if all of Bonnie's books feature a mystery quilt? I don't know if all her books have mysteries - maybe just the older books. I think the last few mysteries she just offered them as a pattern download. BattleAxe those fabrics from Quilted Twins are lovely and the neutrals I want. I love string blocks, so I won't mind at all if she has some! Yummy blacks and whites, Kalama! Love 'em. I decided to join in this year’s mystery. My colors are batiks. I changes out my colors from Bonnie’s My orange is her red. My brown is her orange. I’m using one color for the background. My blue is her blue and my purple is her green. I had gone through my scraps and f-qs last month and I did not have enough in one color to catch my eye. Now off the wash and iron my fabric and patiently wait. I really like like all of the color selections so far. All so pretty. Back on the sidelines. welcome to the madhouse happylab! 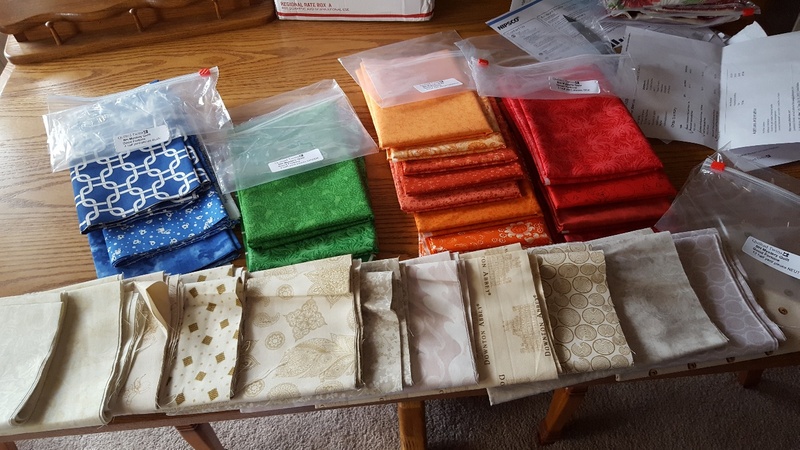 Still working on my stash fabric picks, I think my oranges will be a single goldish yardage. I have very little yardage and would like to use it all up.